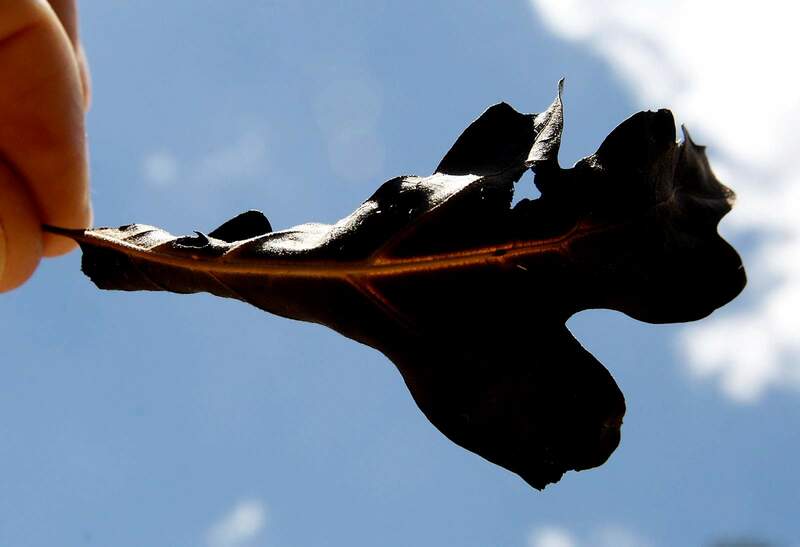 A gamble oak leaf burned in the 416 Fire in the Lower Hermosa Campground area. As the behavior of the 416 Fire slows down, crews are beginning rehab efforts on the eastern perimeter of the burn area along U.S. Highway 550. Fire officials are hoping the fire won’t grow considerably, Knight said. The majority of intense fire behavior is in the interior of the burn area, where unburned fuels could cause smoke columns over the next few days. “Anything that’s remotely close to the line, they’re going in and continuing to mop those up and cool those off and just make sure that the line is contained,” Knight said. The 416 Fire grew to 34,184 acres Thursday and was 37 percent contained, with most of the growth occurring along the southwestern perimeter of the fire. A total of 548 firefighters were assigned to the fire at the end of the day Thursday. That number should decrease after a National Incident Management Organization team assumes command at 6 a.m. Friday, Knight said. NIMO teams typically have fewer personnel but have the resources to access more if needed. The fire, which broke out June 1, has cost $20.5 million. Officials will be monitoring the weather as forecasts predict hot and dry conditions. A red-flag warning was issued from 10 a.m. to 9 p.m. Friday for gusty winds, low relative humidity and dry fuels. Fire officials are expecting temperatures between 81 and 97, with a relative humidity between 10 and 13 percent, and 8 to 12 mph winds, with gusts reaching 25 mph.